In large bowl, crumble warm cake; stir in frosting until well blended. Refrigerate 1 to 2 hours or until firm enough to shape. Line another cookie sheet with foil. In 1-quart microwavable bowl, microwave 12 oz candy coating uncovered on High 1 minute 30 seconds; stir. Continue microwaving and stirring in 15-second intervals until melted and smooth. Remove one-third of the balls from the freezer. Using 2 forks, dip and roll each ball in coating. Place on foil-covered cookie sheet. Decorate as desired. 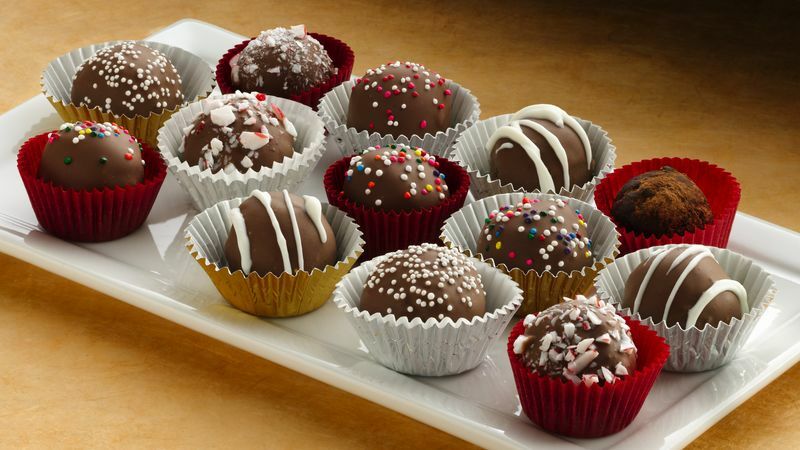 Refrigerate cake balls about 10 minutes or until coating is set. Melt remaining candy coating in 12-oz batches; dip remaining balls. Serve at room temperature. Store in airtight container. To make Irish Cream Balls: Make and bake cake as directed on box. Blend 1/4 cup Irish cream liqueur with baked cake crumbs and frosting. Dip in melted chocolate. Sprinkle with white nonpareils. Serve in martini glass with Irish cream on the bottom. To make Peppermint Red Velvet Balls: Make and bake German chocolate cake mix as directed on box, using 1 cup water, 1/2 cup oil, 3 eggs, 1-oz bottle red food color and 2 tablespoons unsweetened baking cocoa. Mix 2 tablespoons peppermint schnapps with baked cake crumbs and frosting. Dip into melted chocolate. Sprinkle with crushed peppermint candies. December is here! It’s time to turn on the Christmas music, pass around the holiday cookies, and trim the tree with friends! Hosting a tree-trimming party and not sure where to start? Follow these tips for what to serve and activities to enjoy for a swoon-worthy holiday party! Send out Christmas party invitations at least one to two weeks ahead and be sure to let guests know it’s a “tree-trimming” party so they can bring a holiday ornament to hang on the tree. Or, for a more unique twist on the tree-trimming party idea, host an ornament exchange! The best time for this activity-based party is in the afternoon, such as 2pm – 4pm or 3pm – 5pm. Decorate your holiday treats table with festive and fitting décor like crafty “magazine” trees (read the full how-to here). They will brighten up your food table and add height variety. Try brushing the edges with a variety of festive colors in addition to gold (try red and aqua for a retro holiday look). Nothing says holiday party like piping hot Christmas Cocoa and a variety of other spiced drinks. Set up a drink bar on a side console table, along with mix-ins like marshmallows, cinnamon sticks, and rock candy sticks. Kids especially will love stirring up their own cocoa creation. Be sure your tree is up and in its stand prior to the party. If you’re using lights, you will probably want to have those in place ahead of time as well. Select a variety of ornaments and trimmings to decorate the tree. Set up a table with wide-mouthed glass vases and jars full of ornaments. Try spacing the tree in an open area or push the furniture back away from the tree to allow room for guests. Provide a variety of ribbons and craft supplies for kids to make their own ornament to hang on the tree. For example, decorative paper or pipe cleaner candy canes are a great “kid-friendly” alternative to fragile, glass ornaments and look equally as festive hanging on a tree. You can also set up a fun garland creation station using Fruity Cheerios, popcorn and other snacks that kids will love. Read sugarandcharm’s Cereal Christmas Decorations post for more details. These holiday projects will keep the kids happy—and it will give adults time to enjoy the party. Encourage guests (kids and adults alike) to craft an extra ornament to take home! Remember to provide a variety of easy eats and holiday sips to enjoy! Set out ornaments and trimming supplies on a table along with arts ‘n’ crafts supplies for the kids. Turn up the holiday tunes and light up the candles for a festive ambiance! Send guests home with a sweet treat as a favor. I love this cookie cutter fudge!